Grixis Phoenix is a deck looking to abuse the interaction of Dark Ritual and Buried Alive fetching up three Arclight Phoenixes. There’s a bunch of ways to approach this interaction. You could build it more combo oriented with Dark Petition and additional Rituals, or Infernal Tutor and LED. But the combos strength comes from the low resources needed to pull it off in my opinion. To round out the combo you’re looking for 1cmc spells. Cantrips and discard are the most obvious approach. This also leads into the best shell for it, which I think could be a Young Pyromancer based one which masquerades as a midrange or control deck, but has this high ceiling of the combo and turn three kills. Dark Ritual: Dark Ritual is part A of the combo and leads to the most explosive openings. To maximise the decks power level I believe it’s an auto 4-of. Buried Alive: Buried Alive is part B of your ‘Show and Tell’ plan. In my preliminary testing I was playing three copies to help avoid the problem of diminishing returns, but I quickly realised that the first copy is so powerful it almost fully negates that drawback. I believe Buried Alive to also be an auto 4-of in the deck. It's fine to be played as it says on the tin too. You can cast it turn three then follow up with some spells the following turn, or 5 lands is another sweet spot for the deck where you can chain two cantrips into a Buried Alive. Notably the spells don't need to resolve, so it's common to beat a Chalice by casting Buried Alive then throwing some spells into it. Brainstorm/Ponder/Preordain: Cantrips are what make most of the best decks in the format tick, there’s nothing more to say on Brainstorm and Ponder. Preordain didn’t start in the deck though, they were Faithless Lootings at first but very quickly it was obvious that the deck just wants to chain these cantrips into each other to maximise the Phoenixes and rebuy them vs fair decks or to find your interaction vs unfair. There could be an argument for too much air and wheel-spinning, but the deck has such a high ceiling that I believe you want to maximise both its potential and consistency. There are also plenty of decks that use discard over countermagic as their interaction, like Depths decks, Grixis control etc in the format at the moment. When you’re getting into lower resource battles you’re always hoping to draw a cantrip. Thoughtseize: This deck relies on a base of discard to disrupt opponents and power through our gameplan. The reasoning for Thoughtseize and Cabal Therapy is they are able to be played proactively which is what both Young Pyromancer and Arclight Phoenixes want. Countermagic are also options in the deck, though, I ‘ll touch on that later. It’s not clear if Thoughtseize is always going to be a 4-of, but it’s inclusion is at least cemented in my mind. Cabal Therapy: Cabal Therapy does so much in this deck. It synergises with Young Pyromancer, is often two spells to bring back Phoenixes and is a ‘discard outlet’ for Phoenixes (target yourself). Auto 4-of. Young Pyromancer: Peezy is the the key that lets the deck play both fair and unfair. Coupled with discard it’s not hard to clear the way of removal then due to the decks heavy spell count is able to run away with the game. For those unfamiliar in how he synergizes with Cabel Therapy, the token created by casting Therapy in the first place is perfect sacrifice fodder for the flashback. Lotus Petal: This was a later innovation that gives the deck even more explosive openers. Combos on turn one are day and night to turn two to the point that the card disadvantage is well worth their inclusion. It also gives the deck some much needed speed vs other combo decks. Lightning Bolt - Lightning Bolt helps facilitate both the fair and unfair plan. Two hits from three Phoenixes is 18 then Bolt can finish the opponent off while it also picks off the decks hatebears, simply a great card with a lot of flexibility. Two copies is generally going to be enough, but in a metagame with more Delver or other creature based decks I'd play 3. 15 or 16 lands should suffice with the 12 cantrips and Lotus Petals, if you play less Petals I'd add another land or two. Basics - the deck wants to be able to chain cantrips and from them the spells they find so duals are usually fetched out first. But we don’t always have this luxury and vs Wasteland decks we still need to fetch out basics, they’re important for Blood Moon matchups too. The deck is base UB so one of each is sufficient. Duals and fetches - The rest of the manabase is made up of duals and fetches. As stated above, sequencing cantrips and discard spells is critical to the deck so having each fetch get any colour you need is important. Badlands takes after its name, it’s not great in the deck but necessary. You’re almost always fetching out Underground Sea first followed by Volcanic Island. Though a discard heavy hand may be getting Badlands or a second Sea first. The following cards I’ve tried but weren’t as good as expected. Faithless Looting - Looting started as a 4-of but quite quickly I realised that the card disadvantage really hurt. Discarding Phoenixes with them was rarely a winning line and they went from 4 to 3 to 2 then 0. They became the Preordains which has been a massive improvement. Thought Scour - The random draw off Scour is even worse in this deck than usual since you're looking to chain spells, you really want every cantrip to be filtering rather than just velocity. You also don't have a large density of cards you want to mill over, it's just Phoenixes which you already have a good gameplan to get them into the graveyard for and Therapy, which is not worth playing something like Scour for. Entomb (plus all the cute targets for it) - Entomb was decent but rarely did anything before turn three, which it then relied on you being able to cast two other spells for it to turn into a Phoenix. It’s a decent rate for a single black mana, but the effect is still pretty low powered in the grand scheme of things. Entomb was also cut in basically every matchup for being low power level and to hedge vs GY hate. For these reasons I don’t think it deserves a slot. I tried it with all the cute targets like Lingering Souls, Deep Analysis, Creeping Chill etc but all they do is dilute the deck down and give it bad topdecks. Bloodghast - Ghast falls partly under 'cute Entomb targets', but can also be an extension to Buried Alive. While it's kind of a way to play around Surgical, the power level is so low in my experience it wasn't worth a slot. Intuition - I’ve not actually played with Intuition in the deck yet, but it’s suggested by every second person so I’d like to comment on it. It has a few problems to fit into Grixis Phoenix. Firstly and most obviously it’s only putting two of them into the yard, so you probably then want to play more cards to discard the one in hand. Secondly, and much more importantly, it can’t be cast off Dark Ritual. One of the most common lines in this deck is Cantrip/Discard T1 into Cantrip/Discard T2 into Rit+Buried, a large amount of the time you’re finding your second combo piece off the cantrip on turn two. Given that, Intuition is more likely getting back two Phoenixes ~T4, rather than 3 on T2. When constructing a sideboard you should have a clear view of what you want it to be achieving. From testing so far the deck has been struggling most vs unfair decks, especially Dark Depths strategies and Reanimator, so I’ve been concentrating on them. Tormod’s Crypt - This may look like a weird one when Surgical Extraction is a card, but there is reasoning for it. Almost every deck you want Surgical for is also playing discard spells, most importantly BR Reanimator. This deck plays little to no countermagic so we’re not able to protect our hand from that, so I believe it’s important to have something proactive to play. Why I’ve chosen Crypt is because it can be cast T1 through a Chancellor of the Annex trigger, or if they don’t have one of them you can cantrip for it. This same reasoning is true for Dredge, and the mirror should it come up! It could be possible that we should play Surgical too, or a split but in favour of Crypt. Alpine Moon - As I mentioned above, Dark Depths is proving to be one of the hardest matchups. Other options are Blood Moon or Unmoored Ego, but due to all their discard I wanted again something proactive and cheap to cast so you can cantrip into it. It may be a narrow card, but it’s what I’m testing for the matchup currently. Flusterstorm - Generic good card vs combo decks. Force of Will - Another good card for combo matchups, I think you want to play either Force of Fluster. Another thing to be tested more. Abrade - The deck is pretty cold to Chalice of the Void so we need some answers to that. Abrade has fit the bill best so far, nice in Aether Vial matchups too where we can take a more control role. 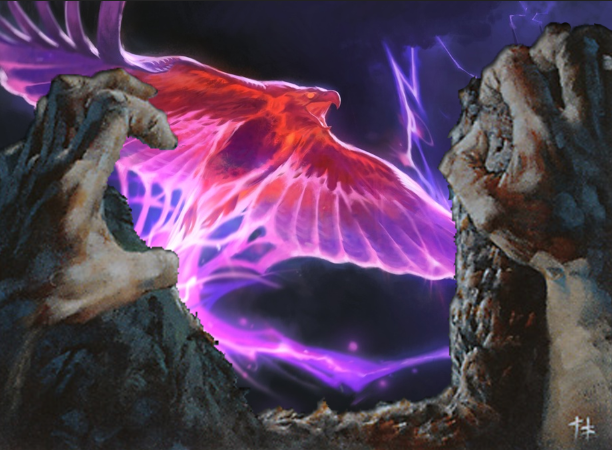 Echoing Truth - Grixis notoriously has a hard time with Enchantments, Echoing Truth is an ‘answer’ to them as well as a nice catch all and has some cross application to help with Dark Depths decks. The key to Echoing Truth is it ‘combos’ with Cabal Therapy. You bounce everything, then name everything. Problem solved! Pyroblast - Blast is just a generically great card, though I don't think it solves many of the decks problems. There will be some metagames, such as heavy SnS or control where it could shine, but I don't think it's worth a slot at the moment. Diabolic Edict - Edict is another nod to Depths while being decent vs creature matchups where we can play control. Thanks Elfkid for the banner! Last edited by Whitefaces; 02-26-2019 at 06:00 AM. I suggest in your list to cut dark rit/buried alive/the standard bird card then replace with good cards . Or...cut the planes walkers/strix and replace with doomsday/emrakul. i still like buried alive for 2 prized amalgam and a narcomoeba. I've loved watching this deck played out in person. That said, I don't think the planeswalkers really fit your gameplan. This can be a really good thing by giving you more angles of attack, or it could just be poor synergy within the deck. Unfortunately, the cards are also just very good on their own which makes it harder to tell without extensive testing. Have you tried something like 3x Snapcaster Mage in this deck? So many good options to try. Just a word of advise to anyone who hasn't seen what this deck can do, Whitefaces knows what he's doing. I've seen enough to know it's very explosive and powerful. I might try the deck out myself, now that I have this primer. Thanks Whitefaces, and I hope you will keep streaming and developing this cool deck. The Lilis are nice because they give you something else to cast off Ritual that is a bomb. I think Rob’s Amalgam idea may be better than my Scourge idea because Amalgam is easily castable if you face GY hate (and you can keep Narcos in play to fly over ground armies/TNN). I feel like if you are trying to go all-in with it you want both moeba and amalgam as well as lotus petal. 18 land seems too many. I'm hoping the update the primer a bit more tomorrow. I streamed another two leagues last night, the VOD is on my twitch. The first was very combo heavy and the second fair, leading to 2-3 and 4-1s which backs up my feeling that the sideboard should be heavily concentrating on combo. Two of the losses were because I was playing Leylines over Crypts interestingly. Not being able to cantrip into them hurts (unless you also have a Ritual to play the Leyline off, it's often way too slow). Second league was almost another 5-0, fell to Shortcake in the final round, their own Crypt beat a T2 combo hand. I'm now trying out different configurations for sideboard hate and countermagic suites. Because of Reanimator we'd love to have some turn 0 interaction. I think Tormod's Crypt is the best gy hate available to us, and Flusterstorm probably the best combo hate, but they don't let us beat T1s. So pairing Leyline with Flusterstorm and Crypt with Force makes some sense, though there is also an option of splitting Crypts and Surgicals too, 3 and 2 sounds like a decent place to start in my head. Hopefully I'll be back with some more info on this soon. That's a cute idea! I know it's not directly connected, but so far Surgical hasn't been a problem, a friend is trying some Bloodghasts to play around it somewhat. Other than that I don't really see a reason to be playing targets other than Phoenixes so long as you're able to hit the spells cast quota honestly, which the deck has been doing. Thanks Max! (I assume this is you). It's been fun playing it too. The Jace I was playing recently has looked pretty bad I'll admit, I'm off that idea now. But Liliana, the Last Hopes have been performing well. Adding strong Dark Rit plays raises the floor of the deck somewhat and she can close to auto win some matchups, like you say she's just good on her own too which while the deck is based on synergy, as long as I'm not sacrificing from that area raising the floor is something I think the deck is interested in. I hadn't considered Snapcaster, seems a bit expensive in the deck to me, while Lili is too she's playable off a Rit, Snap doesn't have _that_ many appealing targets too since it's largely redundant, nice with Therapy though. I could see trying a couple though! Thank you, very kind! Would love to have you on board, you know I'm a big fan of your deckbuilding. Bloodghast is your missing link to successful Entombs. I played all variants of Living Dead Girl/Young Frankenstein/Zombardment/Expendables (my thread) and the minute you include a Pyro + Therapy package you want Entomb with 1-2 Ghasts. Entomb for Ghast is a 1 mana recursive 2/1 and is one of the most efficient way to play Ghast. Entomb acts as an additional copy of Therapy and a single phoenix (AKA: flipped haste Delver). As amazing as Buried and Ritual sounds, it seems to me like the two cards pull you in a direction you don't necessarily need or want to go in (all-in combo ish à la Entomb+Reanimate). You find yourself looking for ways to abuse ritual in what could be a streamlined UR cantrip Delver deck. I think it would be better to try and make this into that Delver deck that dominates Grixis ctrl by slowing it down a little and abuse the availlable haymakers (Delver/Pyro/Phoenix). That way you preserve the traditional aggressive Delver shell and forego a bit of disruption for some recursive threats or increase your explosive potential when left to your own devices. As of now, Entomb for 1-2 Ghasts destroys Grixis Ctrl pre-board so that's something to think about. I think Daze and FoW belong in this deck. The way Phoenix is worded makes it possible to cast Entomb/Buried in a turn post Bolt/Cantrip/counter and still get the trigger off. It changes the dynamics of play on the stack when you can combine your cantrips and removal precomb mainphase to get hasty delvers in play. Check out Izzet Charm instead of Brutality. They are quite similar in function but one is an instant blue spell that you can use as a Looting. It's a good spell to keep in mind when checking the blue count. The threat suite and manabase seem solid but the disruption suite has room for innovation. Perhaps 4 Therapy is better than a TS/Therapy split but Entomb tends to make Therapy much more accessible. For the SB I chose a Surgical/Gravestone split because Gravestone stops Loam clean and protects from opposing Surgicals while shutting down Snaps at the same time. Additional discard over Flusters against Combo because of Therapy synergy and its proactive nature unless you want more blue cards. The rest is pretty standard with an Abrade/EE split against Chalice/Aggro decks, a pair of Edicts against Eldrazis, Depths and TNN, a Needle > Alpine Moon and a spicy Darkblast to top it off. I'd urge you to try the Ritual and Buried side of the deck, it's both more powerful and less all in than you're expecting. It doesn't just sound amazing, it is, though there's been skepticism from a lot of people until they've seen the deck in action. I tried Bloodghast in the first lists, I forgot to add some thoughts on it. It's just so low power level, even if you're doing stuff like Entomb for it, at least compared to what this deck is usually doing. I'd not call it 'finding ways to abuse dark ritual', Buried Alive is doing that already. The engine is powerful enough that I'm now looking for ways to raise the floor of the deck like flooding on Rituals, other good Ritual plays that are also fine on their own (Liliana) is a way to do that. All of what I'm saying is off the basis that you need to see and try Rituals and Buried Alive in action to be sold really since it sounds like you're not. You don't need any other threats, Delver would be the same reasoning as I said for Gurmag Angler, though it's arguably worse. I think you're underestimating how awkward countermagic can be in this deck, but what you have in mind is really different so it's hard to talk on the same things. Collective Brutalities effects have been fine, the problem with it has been 2cmc which Izzet Charm doesn't really solve. Then counters are awkward as Phoenix enablers compared to discard, and the only way to get a Phoenix into the bin (assuming you never want to target yourself with a discard spell) is either Entombing for 1 Phoenix or taking a neg 1 to discard it to Izzet Charm. The explosiveness of Buried Alive seems like it would be easily worth it rather than jumping through a similarly awkward hoop to get just a single 3/2. I agree that you want some kind of other 3 mana black spell to make plays with ritual and that Liliana is a good idea, my immediate instinct is that the deck actually wants Veil rather than Last Hope but maybe shredding your own hand makes it too difficult to return Phoenixes? I don't mind playing e.g. 1 Bloodghast over a Strix just so you have a bit more flexibility with the Buried Alives, in case you need to enable therapy in a pinch or something, but maybe this is unnecessary. I keep trying to come up with a hybrid version of this and reanimator with a 1 of Dread Return to entomb and go with the YP but I can't come up with a version that makes sense (i.e. that deck probably doesn't want to play Phoenix). Isn’t 4 bolts great in this deck? Right, Entomb and Ghast just aren't very good cards. I've been meaning to try a Liliana of the Veil or two, will get around to it soon. The +1 does go against our gameplan a bit of using a critical mass, but we shall see. It's kind of an out to Ensnaring Bridge game one too, which the deck has been suffering vs.
Maybe. The full playset might be a bit excessive, but I've been leaning to playing 3 recently. Reason for not wanting all of them is we often don't need to be killing creatures in fair matchups, the onus is on the opponent to kill ours and vs combo they can be dead. Perhaps I am underestimating the power of Ritual + Buried like you say and that's my loss. However my rational for doing so is that I don't believe it is good enough to be built around as a combo deck because it doesn't stand up to any Reanimator deck out there. 12 Reanimation spells at 1-2 mana for Griselbrand (or better) and Entomb + loots as enablers makes Reanimator a much more consistent and faster deck at doing something better. My idea of a Grixis Phoenix deck gives up the combo aspect in favor of synergy and recursion in a hyper-efficient shell that could leverage those aspects. Izzet Charm is mostly a blue card for FoW and a better Looting. There is no doubt that brutality is very good, just that the lime between the two is fine which makes either a contender for the slot. I completely understand if we are headed in opposite directions and figured any discussion is better than none. I don't mean to criticize your choices but merely to discuss the potential of Phoenix in legacy. Regardless, best of luck in your project! Keep us posted. Thanks. I'm not trying to stifle discussion and sorry if it came across that way, but I think we have different views on what the deck wants to be doing. It's also been compared to Reanimator a bunch of times. While reanimator might be a better deck, it's really not like it. This has way more game vs sideboard cards but is less objectively powerful. Fwiw Jarvis also streamed a straight UR style of this deck with Faithless Lootings and stuff as well as your normal suite of Dazes and Forces, while not exactly like yours the philosophy was more similar. It was a lot less powerful than the Buried version. Your list suffers from a similar problem too because you're playing 4 Entomb and the best thing you can possibly do with it is 1 Phoenix or 1 Bloodghast or 1 Cabal Therapy: if you're going to play Entomb why not just reanimate Griselbrand? Stop discouraging him, the entomb->Phoenix could be the next thunder bluff. -The Narco-Amalgam plan is very strong for a couple reasons. It makes Ritual-Buried on the first turn a must-answer play (yes it's not quite as flashy as the Phoenices themselves, but it's still 7 power that comes down before they've played a land). And, it makes Buried Alive off the top into a bomb if your resources have been taxed. -Bloodghast is medium as discussed in here. Pros: Good with therapy (especially multiples + a fetchland), good off looting, haste can close out games fast. Cons: Not great buried alive target (if you have the follow-up land to bring it back, you can probably just cast a spell or two and trigger Phoenices), can't block which matters in certain combat situations, double-black forces you to play into Wasteland to cast from hand. Will test a little bit longer to see if there's a more consistent way to get it off with Therapy and a fetch more often. -Most of the games I've lost have been to Reanimator. Maybe we need even more GY hate. May go up to 2 crypts cutting a Pyroblast, I guess, but space is getting tight. -I played Echoing Truth to beat Leylines, figuring it's almost as good as Edict vs. Reanimator. But, I don't think Leyline is as big a problem because I won through a Rest in Peace by just letting them spend their turn doing that then casting stuff from hand, and I also lost to a TNN, so maybe Edicts are better in that slot. But I have to finish the league I'm currently in first, hopefully MTGO isn't a pile today. -I find myself looking for a bolt pretty often but not sure I can actually fit more.